Our weatherboards are fibre cement cladding planks that have a natural wood effect and are a low maintenance alternative to traditional timber cladding. 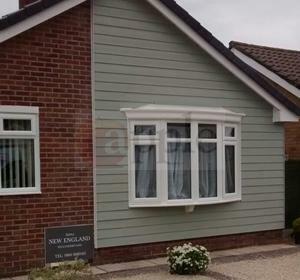 Weatherboards are manufactured from a mixture of cement and organic fillers forming a strong composite material, when installed with our waterproof and fire retardant membrane the weatherboard system is a well-insulated, durable and long lasting product. Weatherboards provide protection from pests, insects and rot. Our weatherboard system will not warp or distort ÃƒÂ¢Ã¢â€šÂ¬Ã¢â‚¬Å“ unlike timber, providing long lasting protection and for your home. The planking style of timber cladding has been popular for coastal properties for many years but is now starting to make its way inland. Its clean, natural style fits any home and creates a layer of insulation that increases energy efficiency. With a range of factory applied colours available, it means you can bring individuality to your home, a transformation that is stylish, low maintenance and long lasting. Our weatherboards have a wood grain finish so you donÃƒÂ¢Ã¢â€šÂ¬Ã¢â€žÂ¢t lose the effect and classic style of traditional timber while reaping the benefits of materials that protect, insulate and give a modern elegance to your home.